This category is where you can find music I've produced and/or performed, usually under the name "Lt. Snorkel" (and previously with the band Happy Wednesday). This includes downloadable, full length albums. There's a new Lt. Snorkel album out -- sort of. There are a couple of new tracks, but mostly Trae went back and rerecorded and remastered a bunch of songs that were previously released. Don't worry though, the music is still available for free. Unlike previous albums though, this one isn't on TRHOnline, but instead BandCamp... on the off chance you feel like tossing a few bucks towards it. So this is kind of a "Greatest Hits" album. Y'know, if any of these had been "hits." "The Moment After" is a Lt. Snorkel EP of four tracks, each slightly different. It opens with a love song. That's followed by the TV theme to a nonexistent TV show. Then there's a cover of a popular top 40 song. Finally, a song about something missing. All performances by Trae Dorn. All tracks written by Trae Dorn, with the exception of "Shake it off" - which was written by Taylor Swift, Max Martin and Shellhead. The official soundtrack for The Chronicles of Crosarth's, The Flight of the Hummingbird features nine tracks inspired by the plot and characters of the webcomic's first volume. The songs vary in style, some interpret scenes while others are character pieces. Best of all? Like all previous Lt. Snorkel albums, the soundtrack is available as a free download. All music is performed and written by Trae Dorn. It is provided as a free download for personal use, and permission must be obtained for any commercial use. "Live at No Brand Con 2008 …and other stuff" is the only real "Happy Wednesday" CD ever released. Sadly it's been out of print for a while, so unless you know one of the few people who has a copy, you can't listen to this feast for the ears. Or something. But worry not, as you can now download the whole thing for the low, low cost of zero dollars! Most of this was (poorly) recorded at a performance at No Brand Con 2008 on 4/19/2008. Live at the Hopper sections were (again, poorly) recorded (in a basement) between 3/1/2008 and 4/15/2008. The studio album meant to follow this never got finished, so really - this is what's left of the (awesome) band Happy Wednesday. Repeated Minds is a Lt. Snorkel EP of four cover songs performed in four different styles. An odd experiment, we present to you these four tracks for free to enjoy as you might want to. Okay, so they're very strange. All performances by Trae Dorn, with the exception of lead vocals on "Cloud Burst" (which were performed by Stephen Smith of Regdar and the Fighters) and Guitar on "The Hokey Pokey" (which was performed by former Happy Wednesday guitarist Matt Biedermann). All arrangements are written by Trae Dorn. Gone Away was written by Dexter Holland and Mad World was written by Roland Orzabal. Cloud Burst was written by Stephen Smith. The Hokey Pokey was written by... someone - exactly who depends on whose story you believe. Larger Than Life was written by Max Martin, Kristian Lundin and Brian Littrell. For the RPM challenge, Regdar and the Fighters endeavored to produce a strange and interesting project -- and for a couple of tracks, enlisted the help of Lt. Snorkel. It's a Harry Potter/I Have No Mouth, and I Must Scream/Dr. Strangelove crossover/author-insertion fanfiction rock opera! What else could you want? 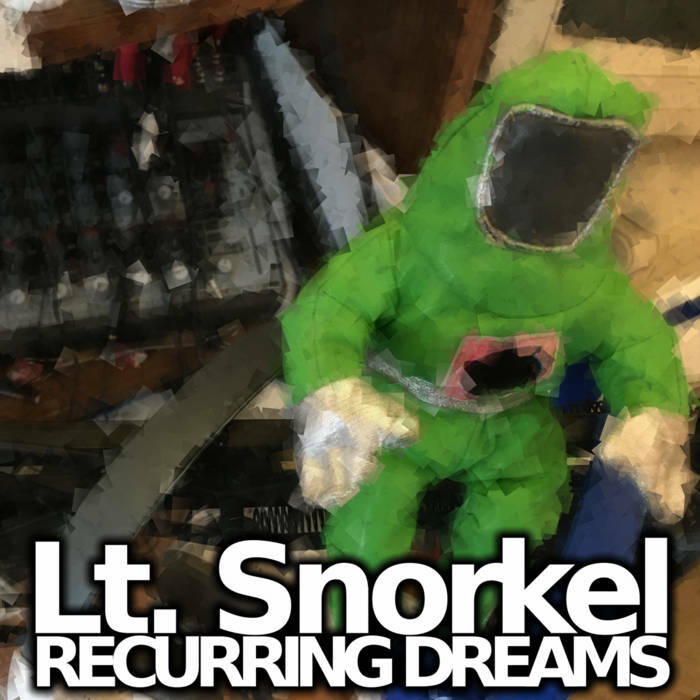 Lt. Snorkel features on tracks 4 and 10. "Mistakes I Made On Purpose" is the fourth official Lt. Snorkel release, and the third full album. It is, as per usual, available as a free download - so get it while it's hot! Or while it's cold! Luke warm even! Electronic Bizarro-Pop has never been more free. Free is good, right? In any case, like any Lt. Snorkel release, some tracks are serious, some are funny, and others are just plain confusing. Good luck. As of the album release, one song has been featured in a No Brand Con 2012 plot video (Track 11 - Hope). Who knows if more will! It depends if they match the theme of the video, honestly. Soundtracks are hard. All performances by Lt. Snorkel (Trae Dorn), and remember - except for the vocals, nothing you hear is real. Well, sometimes the vocals are fake too. All tracks were written by Trae Dorn with the exception of Track 9 (I Lost My Heart To A Starship Trooper) which was written by Jeff Calvert and Geraint Hughes and Track 10 (Thursday) which was written by Trae Dorn and Stephen Smith (as it uses a portion of Smith's Davnesaur as the bridge). "Four Vagabonds and a Goat," the third official Lt. Snorkel release (and second full album), is now available as a free download. Yet again, we delve into a world of electric infused nerd/bizarro-pop. As always, because it's free, that means this music is cheaper than food. If you believe this statement is false, and you know where to get free food - Trae would like to know so he can get free food too. Select songs from this album have appeared in No Brand Con's 2011 plot videos, including tracks 2, 3 and 9. So if you recognize them... well, that's why. All performances by Lt. Snorkel (Trae Dorn), and remember - except for the vocals, nothing you hear is real. Well, sometimes the vocals are fake too. All tracks were written by Trae Dorn. The much delayed second official Lt. Snorkel release, an EP titled "Inverse Proportions," is now available as a FREE download. Featuring a couple of covers, a one minute bizarre piece regarding my friend Kyle, and of course the three part "No Brand Apocalypse" which was composed originally for the No Brand Con 2010 plot videos. Some of these tracks may appear on a full length album in the future. Definitely not that last one though. All performances by Lt. Snorkel (Trae Dorn) with the exception of guitar on track 5, which was performed by Matt Biedermann... although he was unaware of it when it happened. All tracks excepting one and six were written by Trae Dorn. Track one was written by Alex Wilson and Kevin Tambornino, with an arrangement by Trae Dorn. Track Six was written by Felicia Day and Jed Whedon, and I never asked permission to cover it, so I just hope they don't sue me. The First Lt. Snorkel CD, R.O.T.B. (aka "Revenge of the Biblioteca") is now available as a FREE Download. Marvel in the bizarre techno inspired electro pop fantasy that is the Lt. Snorkel experience... or something. Also, like I said before, totally free. That means it's cheaper than food. Will there be a physical version of this album? Possibly. In the future. With bonus tracks. Or Something. All performances by Lt. Snorkel (Trae Dorn) with the exception of the Guitar on Tracks 1 and 3 by Matt Biedermann, and Vocal samples in Tracks 2 (provided by The Chief, RPN, Topher) and 7 (Wilhelm Scream). Released in 2007, this isn't REALLY a Happy Wednesday album. Happy Wednesday was, for most of its existence, a four person nerd rock band. For a brief window though, at its genesis, it was only me (Trae). In that time period, I wrote and recorded this (mediocre) album - none of which sounds like the band that would take this name a few weeks after it came out. Only one song off of this album would be performed by the actual band, and that's Restorative (coincidentally one of the only decent tracks off this album). In reality, this is more of a "Lt. Snorkel" album - and it includes the first variation of the "Priceless" melody. But it would be weird to change the name of the thing, so I offer it to you as is.